This was going to be a story about the introduction of a small exotic species by European settlers to New Zealand, and the possible motivations for it (since this species provides no economic benefits, as a honey bee or a sheep does, for example). However, somewhat inconveniently, I have been thwarted from doing so – by the facts! The little creature I am talking about is the monarch butterfly (kahuku in Maori), which apparently reached New Zealand shores – not by human hand – but of its own accord, about 100 years ago. This is tremendous achievement given its size, and the distance from its native homeland, North America. Unlike other introduced butterfly types, it has not made a nuisance of itself because it feeds only on plants from the milkweed family, such as the swan plant, and leaves the vegetable garden to the white butterfly and its comrades. It is also beautiful, and there is nothing that speaks of summer more than a monarch butterfly fluttering its leisurely way over the warm air currents. Though not endemic, the monarch is now fully adopted by New Zealanders, and is so fondly regarded, that a trust has been established dedicated to the maintenance of healthy populations in New Zealand. But why am I suddenly rabbiting on about butterflies? (if you pardon the mixed metaphor). A few days ago, in somewhat mysterious circumstances, my son discovered a monarch caterpillar under the sofa in our living room. Sofia (get it?) was placed carefully in an icecream container with lettuce leaves (for shelter – they don’t eat lettuce, silly!) and pumpkin retrieved from the compost bin, which they apparently eat when their more favoured foods are unavailable. The next morning, I dutifully trotted down, kids in tow, to the garden centre to buy swan plants, as it was clear Sofia was not at all impressed by the offerings of pumpkin. Introduced to her new home/meal, Sofia (despite clearly being very hungry) took her time to climb up the plant to the top where the youngest and most tender leaves were. I was flabbergasted at the rate at which Sofia munched through the leaves (luckily I had the foresight to buy a back-up). It is quite mesmorizing this creature go about its business, and makes you realise that if we just slow down to see them, there is wonder in the littlest of things. 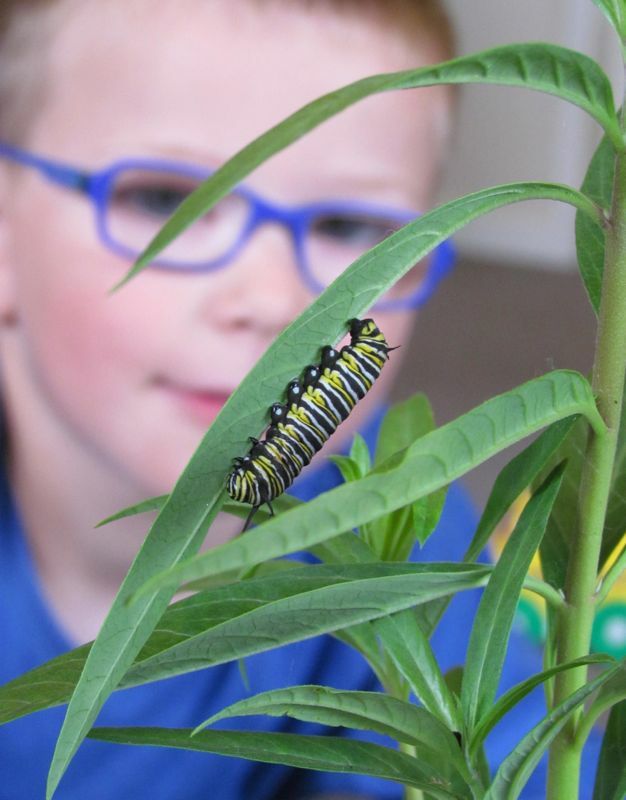 And hypothetically speaking, if the monarch had been deliberately introduced, I can see why – though providing no practical benefit, it brings the kind of pleasure and wonder that only nature is capable of providing, whether one is a little or big person. I didn’t know that they had reached here by themselves, but I do remember the pleasure they provided to us as children, and the general respect in which they were held …… even a long time ago.